Nothing says cozy and comfortable like flames crackling in a backyard fire pit. 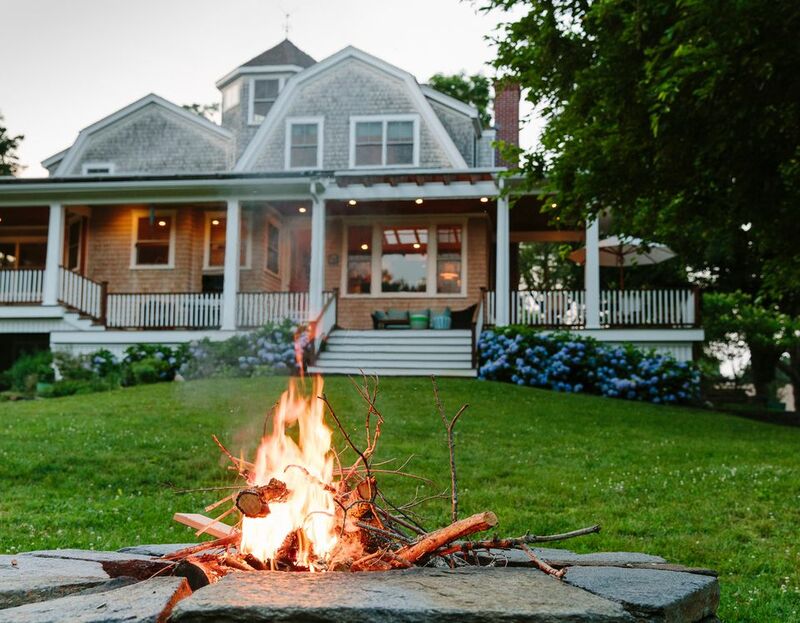 Fire is the ultimate focal point and a traditional gathering spot for friends and family. Imagine sipping wine, roasting hot dogs and making s'mores at your own fire pit during cool summer nights. Even better would be the knowledge that you spent very little on the project because you DIY'd it out of inexpensive materials! Nearly every fire pit here cost less than $100, with several even hovering around the $25 to $50 range. Cheap materials like brick, pavers, concrete and retaining wall block are used. Sometimes, other repurposed materials like metal planters, flower pots or glass are employed. By and large, though, it's the retaining wall block that most effectively forms the walls of the larger pits. Since its sides are angled, it can form a perfect circle, and with no gaps. Gel canisters designed for fireplaces (not cooking) or low-combustion pressed wood logs supply the fire's fuel in most of the smaller fire pits. Real wood logs or charcoals can be used in the larger pits. After her husband got too "fire happy" and cracked their clay chimenea, Kim Anderson of the Thrifty Little Mom blog, decided she wasn't about to give up her backyard fire source. So they purchased retaining wall blocks from their local store and stacked them four tiers high, using the lawn as the pit's floor. To increase oxygen flow, they cut one of the blocks in half and placed each half on opposite sides of the ring as vents. Fast, easy and most importantly, inexpensive: words that describe the approach taken by Kaysi at the home and craft blog Keeping It Simple. She and her husband wanted a backyard fire pit for the weekend, and they wanted it right away. After a trip to Home Depot, they brought back retaining wall blocks, sand, and pavers–all for around fifty bucks. They laid the block ring first, maintaining a diameter of 33", then installed pavers inside. A quick sweep of sand across the pavers was enough to lock them in place and prevent them from shifting. For anyone who is masonry-averse, this truly is the starter project for you. No grout, mortar, or concrete is involved. The hardest part for Kaysi was paring down some of the pavers with a hammer to create a circle. What can an oversized salad bowl, Weber-style grill, can of non-stick spray and bag of concrete do for you? It can all be magically transformed into a sleek, smooth backyard fire pit, all done by yourself, and all for less than $100. This project is a great entree to concrete casting if you've ever wanted to try it. This fire pit uses gel fireplace fuel cans underneath for those bright yet gentle flames, surrounded by black Mexican beach pebbles, easily found at your local home improvement store. Combine a fire pit and Adirondack chairs, and this is what you get: a spot-on design match. Marie, from The Interior Frugalista, built this deck-friendly fire pit within a hexagon shaped wooden frame so that it would blend in with her Adirondack chairs. Flames are supplied by a few gel fireplace fuel canisters or pressed wood logs (such as Presto brand). Decommissioned garden ponds work perfectly as fire pits since they are already lined in non-combustible rocks. Blogger Lucy of Lucy's Lampshades quite inventively turned her old koi pond into a fabulous fire pit for outdoor gatherings. Just as well, she notes, since raccoons and owls tended to gobble up the fish. For less than $25, Karen over at The Art of Doing Stuff whipped up this gorgeous mini fire pit out of glass, a metal planter, and a metal grate. The hardest part was gluing the sheets of glass together with silicone. After that, it was all easy-does-it. She simply placed the four-sided structure into the planter and the grate onto the bottom. Gel canisters fuel the flames. Karen notes that if you cannot find a metal planter like hers, you can use a similarly sized terracotta planter. It's a snap to size this fire pit as big or small as you like. The overall shape is formed by any type of large plastic container such as a flower pot, urn or whatever your creative mind can envision. Spray the inside with non-stick cooking spray, pour completely full of concrete, then set one or more gel fuel canisters into the wet concrete (canisters also coated with non-stick cooking spray). Add rocks or beach glass into the still-wet concrete mix for a beautiful finishing touch. Stylishly simple and costing well under $100, this square fire pit is constructed from cement wall blocks laid in a bed of sand. To prevent the sand from shifting, dig a four-inch hole in the grass with a spade, remove the turf and fill the hole with paver sand. Not all fire pits need to be created entirely from scratch. 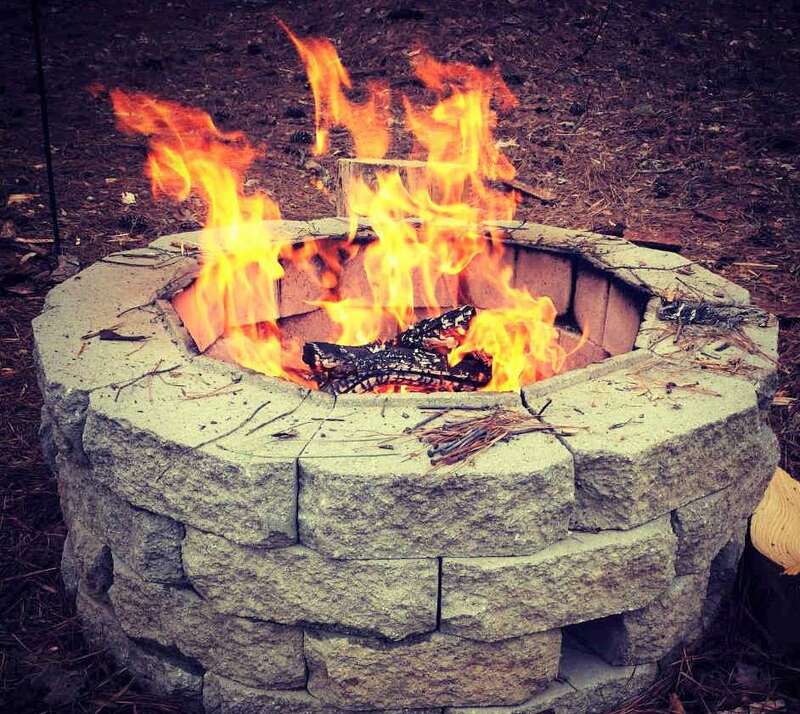 Melissa at The Inspired Room combined a do-it-yourself ring of 44 Allen + Roth retaining wall blocks from Lowe's with a factory-made, ready-to-go metal fire pit kit. Many backyard fire pits, other than offering up visual charm, are essentially non-functional. Stacy at Red Door Home wanted a completely functional fire pit that can be used for cooking all throughout the summer. Two full-size grills rest atop a ring of retaining wall blocks, allowing her to cook up anything from steaks and kebabs to s'mores.